Teaching ESL in South Korea for one year – fun and exhilarating. Teaching for two years – interesting and more time to explore things now that you’re settled in. Haejang Guk (해장국) is a popular soup in Korea. Generally, it’s made with pork or beef, and ox blood. The last part probably sounds a little, like, “whuh? ?”, but trust me the soup is good. It has a very hearty flavor to it. Much like the way good tomato soup is on a cold winter day. With grilled cheese sandwiches, of course. Of all the endless eating opportunities, I ended up wanting to try the chicken feet! They are served up in Korea a few different ways, but the kind I wanted were the hot ones. 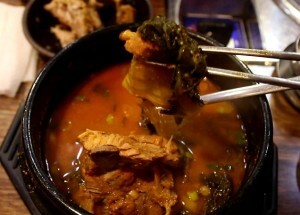 The ones I tried are called 불닭발 (bul dak bal) or “Fire Chicken Feet”. Anytime I see the word 불 in front of a dish here I wonder if I can hack it or not. I mean, I handled the 불낙 볶음면 which is literally translated “super-crazy spicy hot ramyeon noodles to fry off your face”. Yeah, it’s funny how these names pan out. Truth be told, they weren’t the hottest noodles I’ve ever had. So I figured these chicken feet can’t be all that bad. They were. I’m convinced they are marinated with jet fuel or something because after just one tiny piece I was sweating profusely. Not everything you can eat in Korea is going to be delicious. Many foreigners come here and right off the boat the moment they eat anything, they say it’s “delicious”. It doesn’t even matter what it is. It may not even be Korean food! Don’t get me wrong, there are many, many foods here that are completely and utterly addictive. There’s no questioning that. HOWEVER, there will be some things here available to eat that you’d probably wish were not available. Here’s my list of 4 of them. Happy dining! How would your life improve if you learned to speak Korean? The post WINNER of the Korean Language Book appeared first on The Red Dragon Diaries. Korea is a land of unique culinary…ideas. If you’re reading this from back home, you probably think of Korean food as being the K-Barbecue joint in town, or kimchi, rice, and soju. Tuttle Publishing again gave me a book to give away here on my channel. Pretty cool, huh? This is for the polyglots out there, or those who want to come to Korean and are looking to learn the language. The book is called “Elementary Korean” and takes you through a foundation building set of lessons that will prepare you for the next phases of your language acquisition process. How would your life change if you learned to speak Korean? “I’m Not White and Korea Won’t Hire Me! This is a touchy subject. At the same time though, it’s just reality. In the Korean ESL job market for private academies, or hagwons, there’s a lot of negative press. And for good reason. You don’t have to look far to hear of the countless horror stories of bright-eyed, hopeful teachers excited to go to Korea being mistreated in many ways. It serves no purpose getting into the details as I’m sure you’ve heard the same stories that I have. In addition to the working conditions of some of these schools post-hiring, the recruiting process has left multitudes of people stunned and offended. There are numerous recruiters and private academies who make distinctions based on ethnicity. This also is not a new concept. It’s a very unfortunate aspect of job acquisition in South Korea, and it won’t be changing any time in the foreseeable future. There are many museums to see in Korea. In fact, sometimes I feel like it would be an impossible dream to be able to see them all. All kinds of historical museums, art museums, memorials, etc. are found throughout the big cities in Korea as well as the smaller, historical regions like Gyungju, for example.